Here’s one more yummy recipe worth trying out, fresh from one of last week’s episodes of Ready Steady Cook, by one of the show’s regular chefs, James Martin. Perfect for a quick weekday supper and easy enough to whip up when unexpected guests arrive, this is one dish that will please the entire family (just omit the salsa for the little ones and serve it as in the photo above, with greens and pasta). 2. 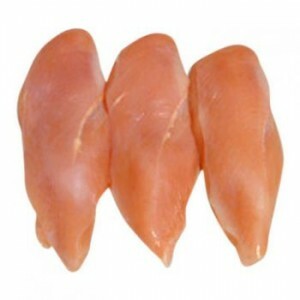 Using a sharp knife, cut a pocket lengthways into the thickest part of the breast. Stuff the pocket with the cheese and fresh thyme and season the breast with salt and freshly ground black pepper. 2. Heat the olive oil in an ovenproof frying pan over a medium heat and add the crushed garlic. Fry for one minute then add the chicken breast and fry until golden-brown. Turn the breast over and transfer to the oven to roast for 10-12 minutes, or until cooked through. 3. For the basil oil, place the olive oil and fresh basil leaves into a food processor and blend until smooth. 4. For the salsa, finely chop the avocado into small cubes and place into a bowl. Sprinkle over the chopped chilli and squeeze over the lime juice. 5. To serve, place the chicken onto a warmed plate. Add a spoonful of the salsa and drizzle the fresh basil oil around the edge of the plate.